All Finals related questions need to be directly emailed to info@westcoastbarrelracing.com. Do not contact the King City Fairgrounds facility directly. Check this page regularly for your most up to date information. Dry camping is free and does not require a reservation. 2019 RV Reservations are not yet OPEN. Stall Reservations open not before May 2019. There is no charge for those hauling in daily. Please remain courteous and respectful when parking. No cleaning out trailers on grounds. There will be designated parking locations for haul ins specifically. Rider must have a paid membership and competed at 10 races to qualify one horse on a single membership. Riders with a double membership and 20 combined races qualify two horses into the finals. There is no limit to the amount of entries a rider can compete on. Each entry must be membered and it takes 10 attendances per entry (5 horses = 5 memberships = 50 attendances). Riders may not compete on the same horse in the same race at the finals. 5D format in the Open. $280 total for all three rounds in the open race. $90/round plus a $10 office fee per entry. No Finals Fees held out ($5) and no entry fee into the average. You must compete on the same horse in IT’S DRAWN ORDER all 3 days to be in the average (running a horse out of the drawn order will result in disqualification of that run and no refund of fees). Fees will be paid in cash or by cashier’s check/money order during check in. Credit cards will be accepted with added convenience fee. You may substitute your drawn horse for $25. This substitution can occur any and all of the three days, however it needs to be communicated and approved by the WCBRA office. Any rider competing on the wrong horse before getting the horse substitution approved will be disqualified from that round and the average. Substituting a horse after the first round will result in a disqualification from the three day average. All vet outs/turnouts prior to entries closing on midnight August 25th, will be immediately released of all entry fee responsibility. Once regular entries close, if reasonable cause for vet/med out and note provided, the contestant is responsible for 30% of all entry fees. If no vet or doctor note can be provided, the contestant will be responsible for 100% of entry fees. Carryover Only. $100 Added/round. 4D Format. 80% payback. $75 entry fee (flat fee for all three rounds | $25 round). Must enter all three rounds. Must be 17 years old or younger as of 01/01/19. The Junior race is for families with little ones. Juniors CANNOT be entered in the open race. No qualifications are required but Juniors must have a current WCBRA membership. The age qualification is 10 and under as of January 1st, 2019. 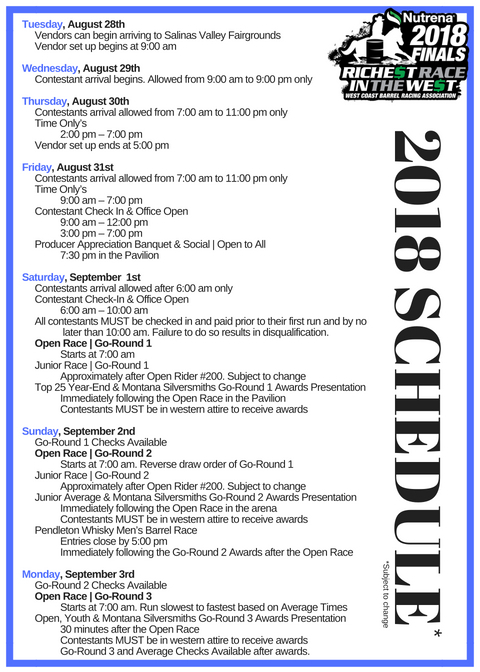 The Junior race will run during a BIG DRAG approximately at draw #200 Saturday and Sunday ONLY (2 rounds, awards through 4th in the Average at minimum). Fees are $35 a day with a minimum of $100 added and a 4D payout. 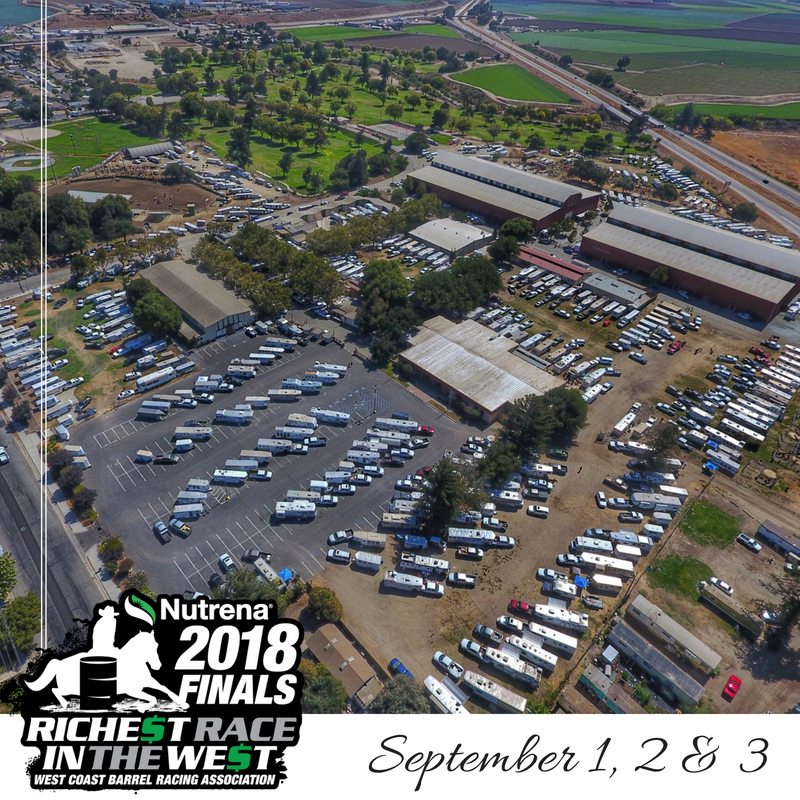 Juniors will enter online with open members and late Junior entries will be taken until the first runner in the Open each day (round 1 & 2 only) at the finals by emailing info@westcoastbarrelracing.com. Late entries for Juniors will be charged a $10 late fee. Year-end awards will be presented to the TOP 25 points finishers. These point values will be based on the placings before the Finals begin, therefore the Finals do not have any bearing on the year-end awards. The awards banquet will immediately follow the conclusion of go round 1 on Saturday. Top 25 contestants must be present during the ceremony in full western attire to received their awards. If you cannot attend the ceremony, arrangements need to be made prior to the Finals with the WCBRA office via email. Average awards to 10th in each division will be presented at a set time shortly after the conclusion of the third go round on Monday. There is no entry fee into the average. As long as a contestant completes all three rounds on the same horse, they are eligible for the average awards. All contestants receiving an average awards must be present during the ceremony in full western attire. More details to follow. Mandatory long sleeved, buttoned up, collared shirt, TUCKED IN. Western pants, cowboy boots and a cowboy hat or helmet. Hats lost in the arena will result in a $10 hat fine, however hats lost before the first barrel will result in a $25 fine. Any dress code violations will results in a $50 fine. Please dress professional, as photos will be taken and displayed in various publications. The main arena will be set up with a holding pen and alleyway. A Race Official will control and police the holding pens. Instead of disqualifications we will be implementing a fine system as follows; Riders are expected to load the holding pens during the drag (5 riders that are up and their helper if needed). The holding pen gate will be closed when the barrels are set and the tractors are parked. Riders and helpers NOT in the holding pens when the gates are shut will be fined an additional entry fee ($100 fine) but allowed to run if they choose to run, so long as there drawn position has not been passed. Riders will have 60 seconds to enter into the alleyway and cross the eye after their name is called. Failure to start your pattern will result in a $50 fine. After 90 seconds, racers will be disqualified for that one round if they have not crossed the eye. If your horse is hard to start, please have a plan. Help, in full western attire, is allowed in the holding pen, but no person or horse is allowed past the plane of the gate into the alleyway except those that are up. You must be mounted when entering the alleyway. No dismounting in the alleyway for any reason. Failure to follow the holding pen rules will results in a fine of a minimum $50. All decision of the Race Official will be final. All contestants and their family members are expected to display good sportsmanship at all times. Foul language, misconduct or abusive comments spoken to any contestant, spectator, staff member or volunteer will result in a minimum $100 fine. Maximum penalty will result in immediate disqualification and no refund of entry fees. Parents and contestants please realize that any abuse via social media, emails, face-to-face or otherwise will result in a fine or disqualification. All decisions by the race director are FINAL. Disqualified contestants due to abusive behavior must leave the premises immediately. No level of abuse will be tolerated at any time. Excessive whipping, spurring, jerking, inhumane equipment etc., will result in a minimum fine of $100 and/or disqualification by a race official. No electronic training devices of any kind allowed, no exceptions. The vendor applications for the 2018 West Coast Barrel Racing Finals are due on July 2, 2018. If you are interested in becoming a vendor there will be a $100 late fee plus all additional Vendor rates that apply to you after the July 2nd deadline if approved. Please contact Taylor Nahrgang at taylor@westcoastbarrelracing.com for more information. All Finals related questions need to be directly email to info@westcoastbarrelracing.com. Do not contact the King City Fairgrounds facility directly. Check this page regularly for your most up to date information.